The Indiana Pacers have been on quite the roll as of late as they entered Wednesday’s tilt with the Toronto Raptors riding a two-game winning streak and winners of five of their past seven games. However, Pacers fans saw their season quickly flash before their eyes during the second quarter when guard Victor Oladipo had to be carted off the court due to a leg injury. 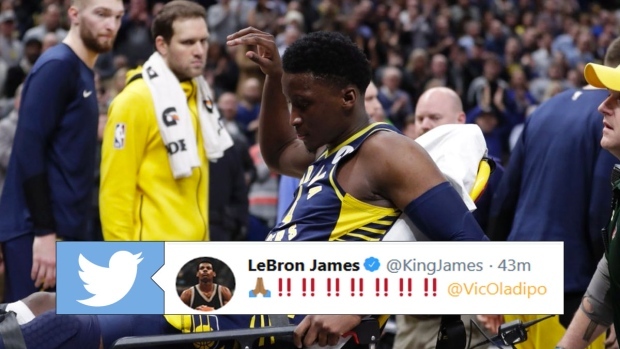 Pacers team doctors knew it was bad almost immediately after they rushed onto the court and covered Oladipo’s knee with a towel before eventually getting the cart to carry him back to the room and players around the league were quick to show him some love on Twitter. Stars from around the league were quick to send Oladipo all the positive vibes and messages, while fans are pretty heartbroken by the whole scenario. Damn not Oladipo. 🙏 Gonna come back even better. 💯 Don't lose yourself. Just got home to see the Oladipo injury news. That's tough and I hope he's okay, just seems like a solid, all-around good dude. Oladipo is leading the Pacers in scoring with 19.2 points per game and 1.7 steals per game, and is also averaging 5.7 rebounds and 5.3 assists per game. The Pacers currently sit third in the Eastern Conference at 31-15 and are 3.5 games back of the Milwaukee Bucks for top spot in the conference.